For example, the size of pollen balls, a source of food, depended on when the egg-laying females oviposited. If the provisioning by pollen collectors was incomplete by the time the egg-laying female occupied a cell and oviposited, the size of the pollen balls would be small, leading to small offspring. 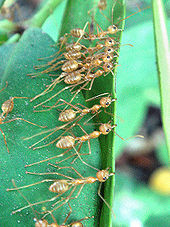 Batra applied this term to species in which a colony is started by a single individual. 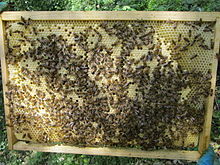 Batra described other species, wherein the founder is accompanied by numerous helpers—as in a swarm of bees or ants—as "hypersocial". 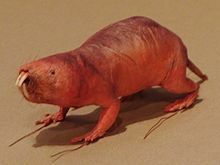 As eusociality became a recognized widespread phenomenon, however, it was also discovered in a group of chordates, the mole-rats. Further research also distinguished another possibly important criterion for eusociality known as "the point of no return". This is characterized by eusocial individuals that become fixed into one behavioral group, which usually occurs before reproductive maturity. This prevents them from transitioning between behavioral groups and creates an animal society that is truly dependent on each other for survival and reproductive success. For many insects, this irreversibility has changed the anatomy of the worker caste, which is sterile and provides support for the reproductive caste. ^ Thorne, B.L. ; Grimaldi, DA & Krishna, K (January 1, 2001) [1st. Pub. 2000]. "Early fossil history of the termites". In Abe, T.; Bignell, D.E & Higashi, M. (eds.). Termites: evolution, sociality, symbioses, ecology. Kluwer Academic Publishers. pp. 77–93. This page was last edited on 20 April 2019, at 21:23 (UTC).